My second book, Between Two Worlds, has come a long way. It has been reshaped and molded for a broader audience. It is also drastically different from the first book I published. It’s theme is time travel and it is semi-autobiographical. Between Two Worlds focuses on Rebecca Harrison, a university graduate student with a good life on campus, good friends, and she is very close to her family. Then Halloween night 2006 it is all taken away from her when she is bumped into as she is leaving a party and falls down a set of stairs. Rebecca is sent back in time and across states to New Jersey and the home town she grew up in Fanwood circa 1983. Further she is forced to pretend to be another woman with the same name as her and seeing her five year old self nearby. The book’s story is her struggle to not only survive the past without being found out, but also to figure out a way to return home without impacting her true time too much. As I have written in the past, this story came about as a result of watching the UK series, Life on Mars on DVD. It is the tale of a police officer named Sam Taylor, who struggles to find out just what he needs to fix from his life and he solves crimes, some directly and indirectly connecting to him, either of these tasks alone or together may send him back to his present time. I really liked the concept and wanted to write my own version without it being a carbon copy. I am pretty pleased with the results of my labors. Hence the photo of the young lady jumping in the air with a smile on her face. I hope you the reader, will be pleased as well. 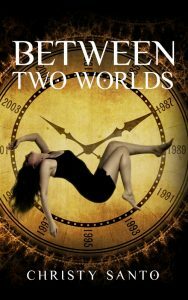 Between Two Worlds comes out June 24th as an e-book and in paperback. To see more details about the book click on Amazon.com.